Plug-in application, "WaveOn" technology. With a wave of the hand, roughly 3-5cm under the sensor, the light will switch from a warm white 3000K light on the top of the bar to a bright white 5000K task light on the side of the bar. The light also has a dim setting, which can be activated by holding a hand under the sensor for a few seconds. Smart controller remembers dimming level and returns the light to the brightness last set. Controls up to 54" of connected bars. 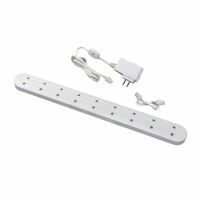 Includes 5' power cord, 20" linking cord and mounting hardware. 4.69 watts, 360 lumens, 84 CRI.